In this stage, I gather information from local contacts here in the village as well as information that I found online before arriving in the village. I have organized it into categories stating where it came from. Food distribution is transporting food from the supplier to the consumer. Food distribution can be the cause of building faster, more direct roads or creating warehouses to store food. There have been many issues in China with food distribution, such as fruit being transported in bags that previously contained animal feed. Some of the food does not have very far to travel because there is farm land right next to the village. The processing of the food (taking the raw ingredients and turning it into food products) takes place in town. For example, the Er Kuai is made from the rice right in the town, where people can buy it and take it home. There are many different styles of cooking which require different ingredients. For example, there is Sichuan cuisine which uses the Sichuan pepper. There is also Hunan cuisine, which uses the red chili pepper. The cuisine of Xizhou is mostly fresh and does not require advanced equipment to transport. There is a lot of rice and wheat farming in Xizhou. The main agriculture products are rice, wheat, corn, broad beans, and garlic. Another food industry that is important in the Xizhou life is fish. Because of the close proximity of the village and the lake, there is a high amount of traffic bringing fresh fish to the markets. The time that I am in Xizhou is peak fishing season (March-April)! Many foods are imported into Shanghai because the foreigners want the same food they had in their home country. The average miles traveled by foreign steak that comes to Shanghai is 13,000 miles. Tea has always been a drink staple in the Chinese diet. For over 1,000 years, mules and horses have carried tea over a network of mountain trails in the Xizhou and Yunnan area. The entire purpose of food transportation and distribution is that there is no one location which has all the needed resources. Say there is a Californian avocado plantation. The soil and sun are great, but there is a lack of water. The water has to be transported to the location where the food is grown. Because people far away from the avocado plantation also want to consume avocados, the produce has to be transported. This is the backbone purpose of transportation and distribution. All of the original Baba have died and locals are not interested in it anymore. Every small countryside village has their own market. Certain restaurants have a contract with farms to get their produce daily. As technology advanced, people began to sell overstock instead of producing for themselves. The foods in Xizhou that are considered local are all locally sourced. In earlier times, horse carts were used as transportation for food, but as motors evolved trucks became more readily available and in use. As demand for trucks rose, the price of use rose and people began buying small motor carts to lower the cost of transportation. There is no real government involvement because the people can help themselves. The government also does not have time for this because they look over a very broad area of land. This topic is not one that is very interesting to the locals, it is just a part of life. No one really studies it, they just do it. Everyday, Zhao Wei Xia goes at 8:30 AM to the morning market and buys pieces of meat. She then carries them back one by one to the store. After she buys and carries all of the meat back, she goes back to the market and buys vegetables. The government does not interfere with the food supply in Xizhou at all, because everything is priced so that people can afford it without the government needing to interfere. Prices have rose over time as the overall market prices rose. When the price of gas and trucks rise, the cost of food rises. Technology has made it so that people can get food faster and freshers, and there are now trucks that can bring around large amounts of food. Every town has a market, so after the food is at the market, we can just carry it home or to where we want to go. They chose their location in Si Fang Jie because it was Zhao Wei Xia's uncle's. Si Fang Jie is also a place where people know that they can gather for food. The restaurant business is a way to get guaranteed money back. Retail stores can lose money. All of the ingredients that they buy are quality, because they did not start a restaurant because they want to make a lot of money. They started this business because they enjoy cooking. Her restaurant opened three years ago and from the beginning she had a sign that was in English and Chinese. She did this because she saw so many foreigners coming to Xizhou. She makes food different depending on who comes in. If a new person comes in, she will ask them if they want their food very spicy. She knows the locals very well so she knows what they want. When men come in, she will normally make a slightly larger portion than making for a woman. All of the things that people love the most are made locally. The condensed milk popsicles are made by all the ice cream vendors themselves. Anything that is foreign comes from a guy who brings it to Xizhou from Xiaguan. She bought in that location because her family owns the place next door and it is very easy to sell their products together. She does not think putting English on her sign is very important. After the Linden Centre was built, there were a lot more foreigners coming to her shop. During the cultural revolution, nobody could own anything so Mr. Yang did not get his shop till after, when Deng Xiao Ping was encouraging people to buy private property and stimulate the economy. Mr. Yang started out renting his current location for ¥170 per month. That price ended up increasing by about ¥100 per month. Si Fang Jie is the ideal place to be. The only reason that the Microcampus students can find Mr. Yang's Golden Flower is because of his location. Most of the places in Si Fang Jie were given to people by their early relatives but Mr. Yang managed to sneak in when the market for private property reopened. At first, the gate in the middle of Si Fang Jie was knocked down because it represented culture during a time where culture like that was looked down on. The second time, it was knocked down by someone who wanted to build a house there. The third and most recent time was when some crazy person just knocked it down. Mr. Yang does not have a delivery service bring him food. Everyday, he goes down to the morning market and carries food back on his back. He feels that there is too much traffic to use a car, and using a car would make too much pollution. Mr. Yang does have a special motorcycle to deliver food to guests at the Linden Centre. A drink shop like hers cannot be sourced locally. For food, people are willing to get local stuff but drinks they want foreign stuff with big names and quality. Most of her stock comes from a vendor in Xiaguan who delivers stock to her on every Tuesday and Thursday. Some of the big name brands such as CocaCola have their own delivery services. As the foreigners started to come, she changed what she was ordering. Before the foreigners, she had never had any coffee drinks in stock but now she has four different brands of coffee drinks. . The concept for a coffee shop started when Xiao Yang and a couple of buddies started to see a flow of foreigners coming in because of new establishments like the Linden Centre. He started this business one year ago. Before that, he had sent one of his soon-to-be staff to go learn how to make Western drinks and dishes, and the person came back knowing how to make coffees, hot chocolate, Western teas, and Western food. That Western food includes things like steak and hamburgers, things that local people in Xizhou do not really like. When the person came back, he found a large space in Si Fang Jie. Si Fang was the spot for him because of the flow of tourists from the Linden Centre. He applied for permits from the local government, but was disappointed because they took so long. He says that they took so long because his restaurant was aimed at tourists and that local restaurant permits do not take so long. He also said that if your restaurant is really small and local, the government will look the other way for a small fee. After he had started renting the location and got permission from the government, he started building supply chains. This meant that he contacted the importers and had them look for the foreign ingredients that he needed. He says that sometimes when the importers charge too much, he will order the products online. This means things like chocolate sauce he will sometimes order on the Hershey's website. Other things, like meat, he said were bought locally through the Muslim butchers. He says that they sell a very high quality of meat and do not try to rip you off. He looked at articles online and in magazines to see what hip Western coffee shops look like. He said he wanted to create the environment "where the writer comes to have a cup of coffee and write a novel." He hopes that the tourism industry continues to develop and give more customers. The owner of the potato stand near Si Fang Jie says that she started out just owning a clothing store, but then since business was not good enough, she started to also sell fried potatoes. She says she gets a delivery of potatoes from the wet market. The baba shop has been open for 10 years and was passed down from the previous generation. The current owners hope to pass it down to their children when they can no longer run the baba shop. She purchases her supplies locally at the morning market. The baba shop does not have a government certificate and rents the space that it uses. All restaurants, stores, stalls, and even carts are required to have a government permit. He did not specify whether the noodle shop has the government papers or not. He asked jokingly if I was here to ask for his papers. 80 percent of his food supplies come from the morning market, and 20 percent come from an undisclosed location. He said that their shop had been open since from the beginning of new China, had closed for a few years, and reopened 5 years ago. The shop on the way to Si Fang Jie has a rice pudding, a tofu pudding, and little rice noodles. She opened for the first time 35 years ago. Her parents had taught her how to make the products that she does. Every day, she goes to the morning market. She goes home and cooks the rice pudding and sweet sauce. Before, she only got local residents, but now she has many Chinese tourists and a few foreign tourists. She used to carry her food from the market, but now she has a scooter to move supplies around. The government requires all store owners to have a government permit, but she did not confirm whether she has one or not. The cold noodle lady has had over 30 years in this business. She started it to make a living, and took private classes to learn how to make the products that she does. She loves this business because she loves cooking outdoors and cold noodles are her favorite. She buys her products from the local market and brings them to her selling spot with her wooden cart. Over the years, she has begun to see more foreigners. The price of her product has gone up 100 times from ¥0.05 to ¥5. She says that the government before did not require a license but now they do not. They made this change 10 years ago. She bought her cart from a special cart maker in the morning market and has used that cart for over 30 years. The owner of rice shop is the sister of the owner of the ice cream shop. Their restaurant has been open 2 years. They used to carry their food from the morning market, but now they have a small car. They owned their location, and Si Fang Jie began to get more tourists. When Sichuanese people come in, they usually give them spicier dishes. When the foreigners come in, they give them dishes with no spice. They say that the government does not require a permit for "their kind of store." All of their recipes have been passed down in the family. They owned the location and as more people began to come to Si Fang Jie, they decided to turn it into a restaurant. 80% of their materials come from the local market and 20% of their materials come from other stores here and there. Their fish they get from a private store and kill them there. The recipes come from a chef that they hired who went to cooking school. The woman at the Er Kuai store says that the government does require a permit but she did not get one because they were too slow. She thinks that the government takes longer for restaurants that have places to sit down. She rents the location that she is currently in for ¥1000/month. She likes Er Kuai, so she started the business. She bought the location that she is at because her children go to school near there so that when they are done with their work they do not have along walk home. The people at the baba store say that they have been open for 15 years. Their parents started the business in the same location. They have been renting that spot for ¥1000/month. She buys her supplies at the morning market and prepares all the stuff in the morning before she opens. Some people order so that she makes it in the morning and they come and get it everyday. The cold noodle shop has been open for 1 year. She sells only cold noodles and rice. She opened her current store because she used to have a small cart in the square but the government does not allow it anymore so she bought a store. She chose noodles because she can make it on her own. She learned how to make the noodles on her own. She bought the space that she is in because her daughter likes that location and she needs to take care of her daughter. She says that you do not need a government permit for her type of store. She buys her ingredients at the morning market. When foreigners come and when locals come, she knows that locals like their food spicier. There are more foreigners now than before. The restaurant behind the coffee shop has been open for over 10 years. He lived in the location that he later made into his restaurant. He made it into a restaurant because he noticed that the bottom floor could be used as a restaurant and profit maker. He buys his ingredients every morning at the market fresh. He has a red electric three-wheeler that he uses to bring the ingredients back. He says that every restaurant in Xizhou requires a permit from the government. He says that now more foreigners come as places like the Linden Centre were built. He makes the food the same for a local and for a foreigner, because they all are coming for the local food, not the interpretation of the local food tweaked for the foreigners. The delivery man that I met in Si Fang Jie brings all of his supplies from Kunming airport, where goods are flown in. He then goes through Xiaguan. He got into this business right out of college. He says that before, his company used a three-wheeler to bring all of the food and now they use an actual car. The man at the baba shop between Old Town Snacks and the other baba shop says that he is in the location where the original baba makers were. He has been open for 5 months. His baba has 200 years of history. He buys his ingredients from Xiaguan. The space costs him ¥1000/month. He says that his wife makes their lard and invited me to go sit and watch her. The space is new because it was made from splitting a bigger spot. He says that the government does not require them to have a permit for their space. He makes his baba the same for all of his customers and even for himself. His store has been open for 40 years through three generations. He wants to pass his store on to his children, but if they do not want to they do not have to. He owns the location and lives there. There has been no change in flow of customers. He gives foreigners and locals the same product. 1. 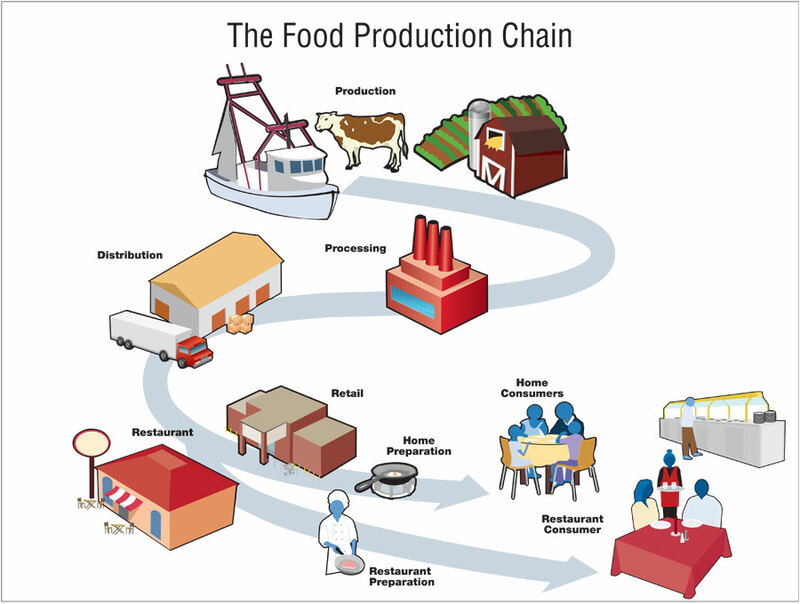 What is involved in bringing food from the area of production to the table? Now in modern society, most of the food chain is where food is brought from the factory to an airport in a truck, and from the airport to the towns by truck. Much of the food is brought to a local market where the locals, and restaurants go to purchase their ingredients. Some restaurants get their ingredients directly from the delivery service. 2. Is the Xizhou food distribution system part of a bigger system? Yes,because even the seeds for the foods that are grown locally are imported from overseas. All of the bottled drinks, and canned or bagged goods are brought in from overseas. The trucks that are used to bring things around are from overseas, or from other parts of China. 3. Are most of their needs and wants met by local foods? Many people in the village can live sustainably from what there already is here, but as new products from outside places are being introduced, people begin to want these new products. This is where bottled drinks come in instead of drinking the local tea, milk, or water. 4. How does weather and season affect the food supply? Because everything is so well protected during its transportation, the moving around side of the process is not affected. As for the availability of agriculture and crop products, it depends on whether it can grow at a certain time. For example, the green chili is currently very spicy, so those looking for a mild chili will have to wait till next season. 5. What is government involvement in the management of restaurants? Some people say that you do require a government permit, and others say that you do not. There are certain places where people can operate a business, and other places where they cannot. 6. Is there a wholesale market where retailers buy, or is their stock delivered? In many of the villages there is a market where single people and restaurants alike go to get their supplies. Only the materials like bags of chips and bottled drinks are delivered directly to the vendor. 7. How has the transportation method changed over time? Everything started with people walking and carrying supplies in bamboo bags on their backs. Eventually that turned into pushcarts, then bicycles. Now, people use motorcycles, three-wheelers, or even full car/trucks to move around food. 8. How does food change based on whether a Westerner or a local is being served? For all of the restaurants that I interviewed, they say that the only difference is in spice. They know that the local people want more spice than the foreigners. Other than that the food that they serve is the same. 9. Are food recipes less traditional because foreigners want everything different? Many of the restaurants that I have interviewed have said that they do not change the recipes from tradition because they know that the foreigners are coming there to see their culture. They are not tweaking so that the foreigners get the real deal. 10. How do certain locations develop which are better spaces for restaurants? Many restaurants are built when people want to turn a ground floor space in their home into something that gains profit. This is where most restaurants are built. Other places like Si Fang Jie develop when there is a constant flow of people or when it is a hub for the town. Si Fang Jie is a very culturally important landmark. In Phase 4, I will be preparing to share what information I gathered in Phase 3 and how I can share it in a way that will be effective and meaningful. I'm 14 years old and I was so happy to get a chance to participate in the Groundbreakers group of Microcampus (March 2014). I am a person of diverse experience, having lived in the United States, India, Singapore, and now China. The Microcampus experience expanded my learning and intercultural understanding, as well as gave me new methods of work and ways to live. I went to Xizhou to study restaurant management. Microcampus was amazing, I wish I could do it again.